Dr. N.K. 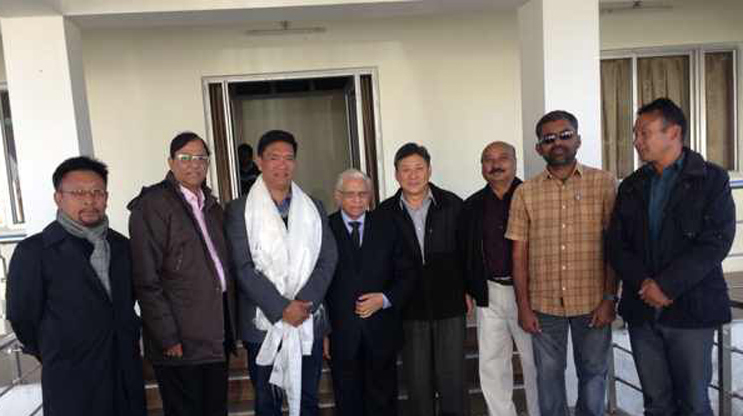 Trikha, National Convener, Mr RK Khrimey, Convener for the North-East States, Mr JP Sharma, Regional Convener (Delhi), Mr Sonam Norbu Dagpo, Secretary CTA, and Mr Pema Khandu, Minister of Arunachal Pradesh at the Core Group for Tibetan Cause Meets in Tawang. (TibetanReview.net, Nov14, 2014) – The core Group for Tibetan Cause, a pan-India group which advocates Tibet’s independence from Chinese rule, has held a public meeting on Nov 9 in the sensitive state of Arunachal Pradesh which borders Chinese ruled Tibet to garner public support for its campaign. The venue was Zomkhang Hall in Tawang District. Mr RK Khrimey, the group’s Convener for the North-East States and the state’s former finance minister, now a Lok Sabha MP, called on the people of the district to unite and rise for the Tibetan cause, reported arunachaltimes.in Nov 11. Others who spoke included the group’s National Convener Dr NK Trikha, who expressed optimism that the Government of India would accede to the group’s call for the conferment of the Bharat Ratna or at least the Gandhi Peace Prize on Tibet’s exiled spiritual leader, the Dalai Lama. Delhi High court advocate Mr JP Sharma, the group’s Regional Convener (Delhi), also attended the meeting, as did Mr Sonam Norbu Dagpo, a Secretary at the exile Tibetan administration’s Department of Information and International Relations. Earlier, on Nov 8, members of the group met with the state’s Urban Development, Tourism, Art & Culture Minister Mr Pema Khandu and also interacted with students from Tawang District.